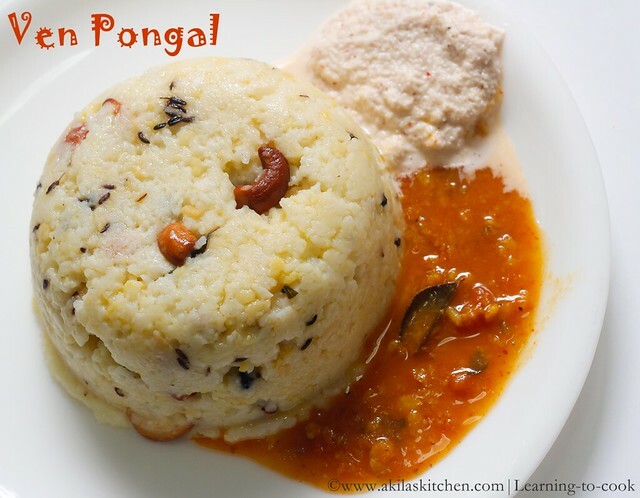 Khara Pongal / Ven pongal is a tasty and filling breakfast in the morning. It is also prepared during festival times. I just love the smell of the thalippu which we do during the pongal. 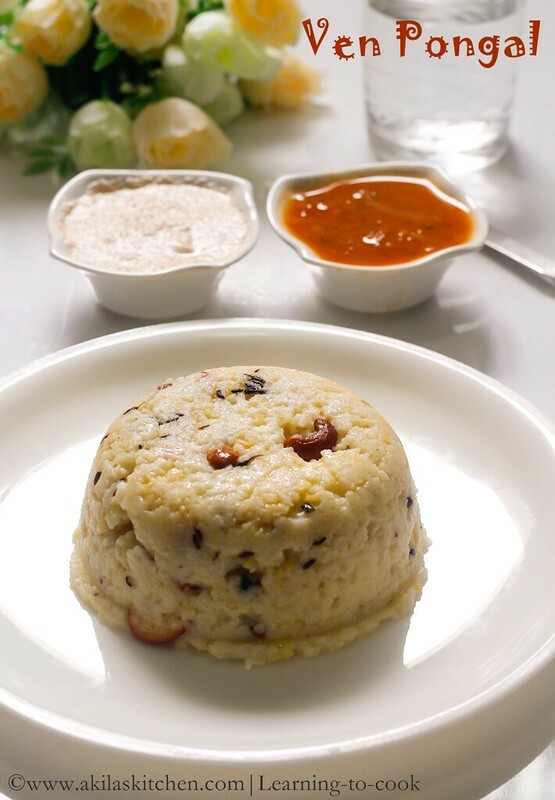 Ven Pongal with medhu vadai is a awesome combination. 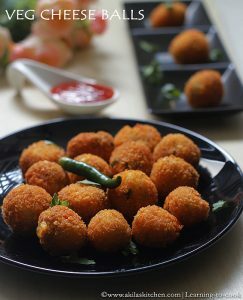 If I happen to go to hotel in the morning, I always go for pongal with vadai only than any other breakfast. I already posted ven pongal, but this is with step by step pictures and here I am going to cook the dal and rice separately. 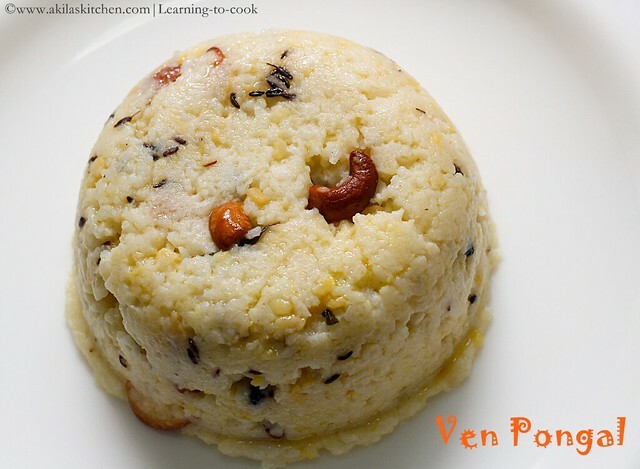 Lets see how to prepare basic Ven pongal in step by step method. 1. Take the 2 cups raw rice and 1 cup dal. 2. Place the rice and dal in the cooker with enough water as mentioned. Here I have kept them separately as shown. You can also add them together. Close the cooker lid and cook for 4 whistles. 3. Now mix the dal and rice together, adding the required salt. 4. In another pan, add the ghee and when it is hot add the cumin seeds, black pepper, curry leaves, ginger, asafoetida, cashews and fry till cashews become golden brown colour. 5. Now transfer this content to the cooked rice and dal and mix well. 6. Add some more ghee if you are not health concerned. 7. Mix well and serve hot with sambar and chutney. 1. If you are using dalda, you can add half ghee + half dalda. I used fully ghee only. 2. 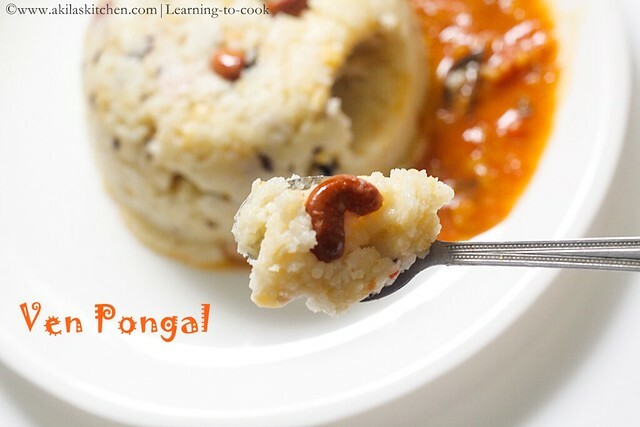 If the pongal is bit dry, you can add, 3 to 4 tsp, hot water, to make the perfect consistency. 3. If the pongal is watery, you can cook for some more time, till it comes to the correct consistency. 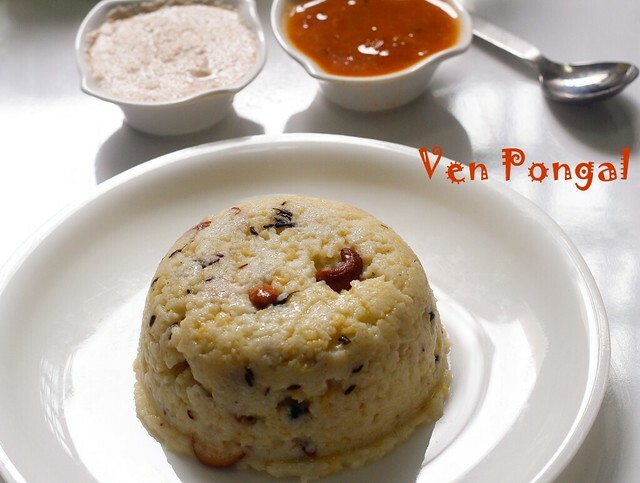 Delicious and tasty ven pongal is ready to be eaten. I really need to try your south indian dishes, they all look so amazing. I vaguely remember what Pongal tastes like. wow such an drool worthy platter 🙂 venpongal looks super inviting and tempting me dear !! I really love this pongal. Well presented with nice pictures. My take is the savory version because I am not much into sweet stuff. Love the aromatic and wonderful flavors of kara. Drool worthy and filling,thanks for sharing.